APPLICATION FOR MEMBERSHIP The following notes are to assist in the application. PERSONAL DETAILS are needed both for our records because we are obliged to inform the Police of any Application. If we do not hear back from them within a short while we process the Application. PROPOSED AND SECONDED. 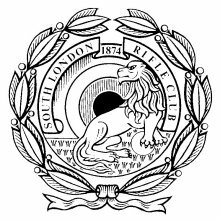 The form must be signed by current members of the South London Rifle Club. REFERENCE from the Secretary (or other named official --- Chairman, Treasurer, Captain etc.) of a Home Office Approved Club. If your FAC is for ‘Target Shooting’ we would prefer the reference to come from your ‘Principal Club’. CHEQUE for £55.00 for membership, made out to THE SOUTH LONDON RIFLE CLUB, when we have received a nil response from the Police, only then do we bank your cheque and process your membership. PHOTOGRAPH. One passport size photograph for your membership card. Please write your name on the back and ask your proposer to sign that it is a true likeness. PHOTOCOPY of the first page of FAC. Both for your bona fides and also to verify your photograph. We do not operate a "Probationary Member" scheme but if you are not an FAC holder you may apply to join if you are already a FULL member of another Home Office Approved club. If you shoot anything other than target velocity .22 at Bisley or on any other military range we require photocopies of both sides of your current ‘Shooter Certification Card’. We suggest that you write ‘Specimen’, in ink; across the photocopies for security purposes should they become lost in transit. DECLARATIONS are required in law. KEY to the Clubhouse will be sent to you with your Membership Card and paperwork.